Doha, Qatar – October 15, 2018 – A new book by Northwestern University in Qatar Professor Sam Meekings uncovers the story behind a painting by Vincent van Gogh of his personal doctor, Paul Gachet. The book explores the history of Gachet’s life as well as the painting itself and brings nuance to this doctor’s melancholy character. Meekings, an accomplished novelist and poet, is launching his new novel “The Afterlives of Doctor Gachet,” at the London Review of Books Bookshop in Bloomsbury, as well as delivering a live reading and talk at Oxford University in the U.K.
“It follows Dr. Gachet’s life, from his work in asylums and cholera wards to the controversial exhibitions of the first Impressionists, from the battlefields of the Franco-Prussian war and its bloody aftermath in the Paris Commune, through to treating Van Gogh in Auvers,” said Meekings. “This is the latest of Sam Meekings’s already distinguished roster of books that illuminate his talent as a story teller—and gift as a writer,” said Everette E. Dennis, dean and CEO. Through historical fiction, Meekings explained that his book portrays similarities and differences in how people responded to depression over the last hundred years. “On the one hand it shows us what life was really like in different eras, cultures, and places, and on the other, it reminds us of how similar each of us is deep down in our longings, doubts, desires and goals,” said Meekings. In the book, Meekings traces the journey of Van Gogh’s painting, Portrait of Dr. Gachet, from fashionable Parisian salons to the bunkers full of confiscated ‘degenerate’ art in Nazi Germany, and from refugees arriving in America to its mysterious disappearance with a reclusive billionaire in Tokyo. After suffering a number of psychotic episodes – one which ended with the severing of part of his own left ear – Van Gogh spent his last weeks getting treated by Gachet. It was during that time that Van Gogh painted two famous portraits of his “heartbroken” doctor sitting at a table and leaning his head on his right arm. The paintings, which are now worth more than $150 million and are among the most expensive paintings ever sold, carry a deep mystery and untold stories that Meekings explores in his book. Meekings is an assistant professor in residence in the Liberal Arts Program. 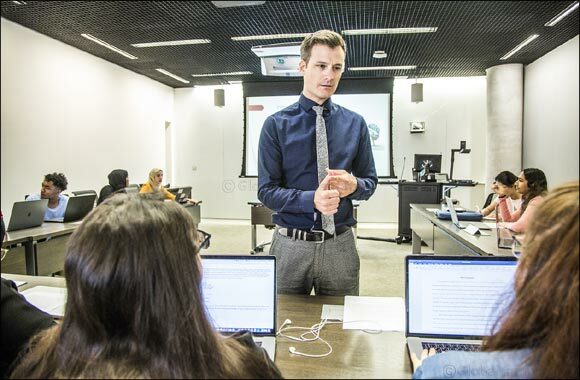 He has edited several non-fiction books and has previously taught at Qatar University, the University of Chichester in the U.K. and at New York University’s Shanghai campus, as well as at Chinese universities and colleges—Qingdao Baishan College and Hengshui University. He received his BA from Oxford University and has two master’s degrees, one in creative writing at the University of Edinburgh and a master of arts at Oxford University. His PhD in creative writing is from Lancaster University.